Buy American Ultra cheaply from Amazon. You too can earn money from writing articles by signing up for InfoBarrel. American Ultra opens with an extremely battered-looking Mike Howell (Jesse Eisenberg, Now You See Me, The Social Network) in an interrogation cell somewhere, with his wrists and ankles chained, both to himself and to the table and chair. Then it goes back three days. Mike lives in the town of Liman in West Virginia. He's a stoner, a bit of an idiot, in a rather dead end job at the practically deserted Shop-N-Save. He lives with his girlfriend, Phoebe (Kristen Stewart, Snow White and the Huntsman), and his relationship with her is the only bright point in his existence. Every time he tries to leave town he has a panic attack, so a romantic trip away to propose to her failed when he couldn't get on the plane. 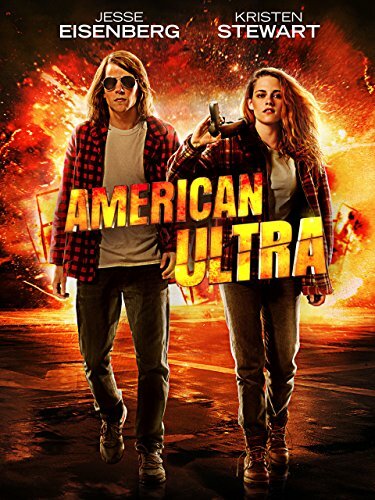 Credit: https://en.wikipedia.org/wiki/File:American_Ultra_poster.jpgMeanwhile, at the CIA headquarters in Langley, Virginia, Victoria Lasseter (Connie Britton), gets an anonymous phone call telling her that Mike Howell is going to be terminated. Howell wasn't always a stoner; he was part of a secret Ultra programme at the CIA. Lasseter seems to have fallen on hard times within the agency since the programme failed. Adrian Yates (Topher Grace), who it appears may have supplanted her position, has ordered that asset Howell be terminated, because of his attempts to leave town. Apparently that, and a host of his other personality problems, were actually traits implanted in him by the CIA. Lasseter decides to intervene, and heads to Liman to speak to Mike at the Shop-N-Save. She tells him, repeatedly, a code phrase that sounds like complete nonsense - and that's what Mike thinks it is, not recognising it for what it is. Later that evening, when Mike goes into the shop's car park to smoke, he sees two men messing with his car. When he asks them to leave it alone, they approach and attack him. At this point, it's revealed that Lassiter's code phrase had actually worked, as he kills both men, even though he was initially armed with just a spoon and a cup of soup. Shocked by what happened, Mike calls Phoebe for help. Meanwhile, Yates realises that Howell has been activated, and sends in more operatives, including agents from his own Tough Guy programme - and they seem to be a really odd bunch - as well as the army, and the CDC and FEMA to cordon off the town. Things now get rather bloody. Mike has a whole new set of skills, and knowledge, that he didn't realise he had, so when Yates' forces come after him, he is rather effective at disposing of them. Not generally with guns, though; instead he seems to use improvised weapons, such as kitchen equipment, tools - and food. Unfortunately, he's also still a bit of an idiot. Rather effective at killing, but an idiot - it seems that he hasn't managed to break that bit of the programming he went through when he was released from the agency. Meanwhile, Yates is summoning more forces to stop Mike, and Lassiter is trying to help him. Topher Grace's Adrian Yates is a suitably annoying villain for the piece and Kristen Stewart is Kristen Stewart - not particularly convincing in her role. There is a twist to the plot which can be spotted before it arrives, as there are clues given away before it's reached. The premise of the film is interesting - an idiot stoner who turns out to be a deadly CIA agent - but the execution is a bit off. The film is definitely on the violent side, but it is also trying to have funny bits too. This can definitely be done; there are films that mix bloody violence with humour successfully. This doesn't really seem to be one of them, though. Instead, it seems that it's trying to be too many different things. Possibly a little more focus could have been used when the film was put together; there's the impression that more was trying to be put in than the violence and humour, and this ended up diluting both. Jesse Eisenberg does try his best - and this is an actor who has successfully mixed humour with bloody violence in the past (Zombieland) - but it feels like he hasn't been given enough to work with. He does manage to have some funny lines, but they are a little lost in the rest of the film. Killing people with ordinary items is a good part, though. Many of the supporting actors have got even less to work with, and their roles could have been filled by practically anything. The references to Ultra suggest that this is tied into historical conspiracies - such as MK Ultra - but nothing related to that is mentioned in the film itself, which leaves you with the impression that something important has been cut out somewhere. In the end, American Ultra was an interesting idea that could have been so much better than how it actually ended up - although the animated end credits are fun to watch, as they feature Mike Howell's cartoon ape hero. I debated going to see this, as it looked like it might be a "mindless fun" kind of flick. The more I heard about it though, the easier it was to decide to pass on it. I do feel that the film could have been, and should have been, better than it was.